Sometimes basic is good enough. And my lunch at Eli’s in Hamden was good solid basic fare in a friendly environment with an outstanding server. The four of us decided to go to Eli’s for lunch after temple. It is conveniently located near Route 15 and there is ample parking across the street. We grabbed a table for four in the main dining area and Mike, our server approached. He was fantastic, patient and spot on throughout the lunch. 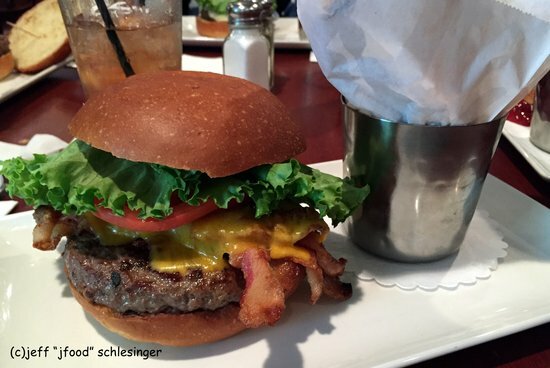 It was midday and the menu included an entire section on of my favorite meals, hamburgers. I chose the Bacon and Cheddar with regular fries, medium-rare. When it arrived the first noticeable feature was the size. In addition to a large patty, there was ample bacon jutting out of the sides, plus lettuce and tomato, all enclosed in an enormous bun. The meat was grilled to my requested medium-rare. My impressions were that the meat was mild in flavor, nothing special and good. The bacon was also grilled properly, crispy without being burnt. The cheddar was too mild to compete with the bacon and I would have preferred a larger amount to deliver more cheddar flavor. The bun was buttery, almost a brioche and it was very good, but a smaller size would have been more in proportion to the other ingredients. The fries were very good, crispy on the exterior, soft on the interior, and properly salted. 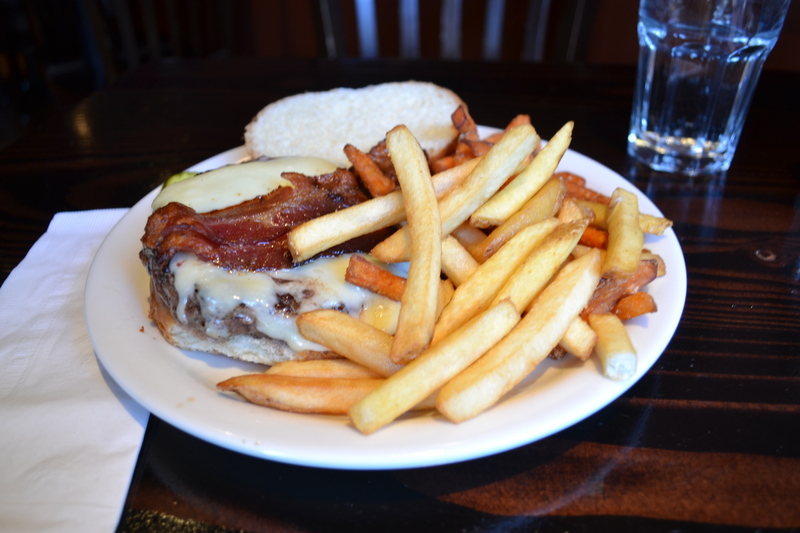 Overall Eli’s delivered a very good burger in a relaxed, family environment with a great server. Over the last year I sampled over over 60 burgers in search of the best Bar Burgers and Best Restaurant Burgers. Louis Lunch (New Haven) – This institution is still serving a great patty using its patented vertical flame grills from 1895. You can ONLY order cheese, onions or tomato, served on toasted bread. The beef was excellent, great flavor and nicely seasoned. The cheese was well melted and the toast held it together. 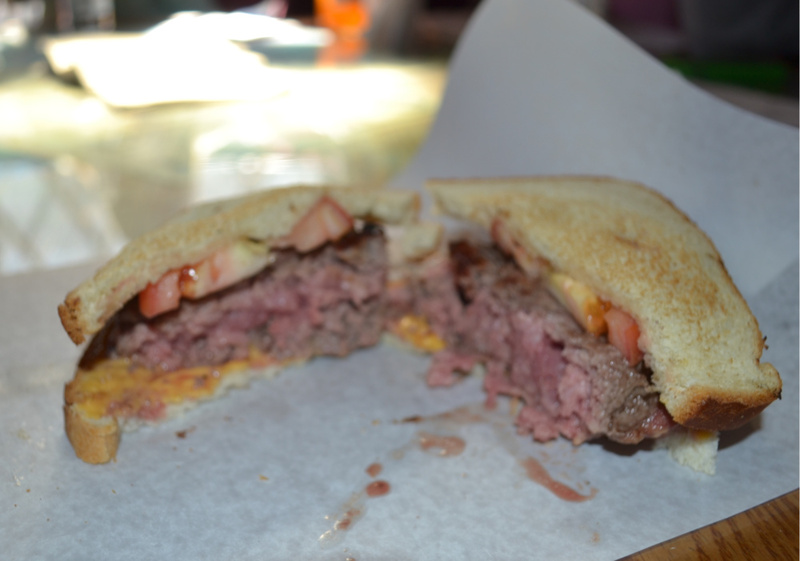 The tomato and bread were not in the same league as the incredible meat, but the historical claustrophobic ambiance and its inclusion on everyone’s “Burger Bucket List” gave Louis the #10 slot. Apologies for the poor photo. Impossible at the table with so much pushing and shoving.